Referred to locally as golden foot, sheep are a farmer's friend and we have seven breeding ewes. Allowed to remain with their mothers our spring lambs are left to wean naturally. They are not forced on, which means most of them are sold as hogget when they are around 18 months old. Winter on Exmoor can be tough, so for that reason we collect fodder in the form of hayledge from a neighbouring farm, but most of the time there is enough grass around for them to pick at. We believe the extra time it takes to grow naturally leads to a carcass of superior flavour. 'The meat from hidden valley pigs is simply superb. The lamb is so incredibly tasty and so tender, it was wonderful to be eating lamb that really tasted like lamb again, as I remember it from my childhood'. 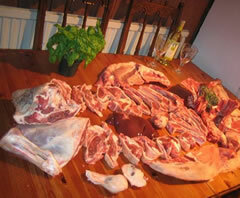 Available as whole lamb for £125 or half lamb at £70. Hogget and Mutton is sometimes available, please call for availability. Orders are guaranteed to be delivered the following day. Mixed meat boxes are sometimes available, have a little of everything you fancy!